In the 1990s, the rising affordability of home computers brought about the “edutainment” trend, where companies tried to use computer games to teach kids—and to convince their parents—that technology wasn’t evil. One of the most successful of those attempts was Where in the World Is Carmen Sandiego?, a game where the player was a detective for the ACME Agency, chasing a rogue agent-turned-red-fedora-wearing criminal named Carmen Sandiego. Carmen and her henchmen from V.I.L.E. (Villains’ International League of Evil) hopped around the world, trying to steal landmarks like the Leaning Tower of Pisa. As kids followed Carmen and V.I.L.E. with clues like “she’s learning Portuguese” (head to Brazil!) or “she changed her money to rubles” (next stop: Russia! ), they also learned about geography and history. The games resulted in several spinoffs, including Where in the USA is Carmen Sandiego? and a PBS kids’ TV game show where real-life middle schoolers won prizes for successfully answering questions about geography. But here’s what you may not know about Carmen and all her incarnations. 1. THE SHOW WAS INSPIRED BY A STUDY SHOWING HOW LITTLE MOST AMERICANS KNEW ABOUT GEOGRAPHY. Following the success of the Carmen Sandiego computer game, two PBS affiliates decided to make a trivia show based on the game. Part of their decision came from a recent National Geographic study showing that one in four Americans couldn’t locate the Pacific Ocean on a map. 2. CONTESTANTS WERE RECRUITED FROM NEW YORK AREA MIDDLE SCHOOLS. Mark Trinidad appeared on an episode of Carmen Sandiego in 1992, when he was 12 years old. The show worked with a teacher at his middle school in Teaneck, New Jersey, who selected a group of the school’s top geography students. Those kids were quizzed and interviewed by producers, and then some—like Mark—were picked to be on the show, which taped on a lot in Queens, New York. 3. WINNERS RECEIVED GLOBALLY-INSPIRED PRIZES. Although Mark won his episode of Carmen Sandiego and made it to the final round, he didn't win the grand prize: a trip. He did go home with some other swag though, including a basketball designed to look like a globe, a portable CD player, and some world music CDs. He also got to keep his contestant nametag. 4. THERE WAS ONCE A CARMEN SANDIEGO GAME SPECIFICALLY ABOUT THE STATE OF NORTH DAKOTA. There have been multiple Carmen Sandiego games, including Where in Time… and Where in Space…, as well as editions focusing specifically on Europe and the United States. But the state of North Dakota got special permission to make a Carmen Sandiego game in honor of its 100th anniversary in 1989. 5. THE CHIEF HAS A TONY AWARD. Actress Lynne Thigpen, who passed away in 2003, was beloved by middle-schoolers, thanks to her role as The Chief in both the Carmen Sandiego games and TV series. But her acting career had numerous other highlights, particularly on Broadway, where she won a Tony Award for An American Daughter. She was also an ensemble member in the film version of Godspell. 6. CARMEN IS AN EGOT. In the animated TV series, Where on Earth Is Carmen Sandiego?, Carmen became a more fully fleshed-out character. We learned that she grew up in the San Francisco Bay Area (no, not San Diego) and that her middle name is Isabella. During the series, she was voiced by Rita Moreno, an EGOT (Emmy, Grammy, Oscar, and Tony) winner, whose Oscar came from playing Anita in West Side Story. Moreno was nominated for three Daytime Emmys for her voice work as Carmen, but she didn’t win. 7. THERE IS A MISSING EPISODE. One episode of Where in the World is Carmen Sandiego?, “Auld Lang Gone,” never aired because the winning contestant (a.k.a. “gumshoe”) fell during the bonus round and broke her arm. 8. CARMEN HAS A CAT NAMED CARMINE. Carmen’s cat, Carmine, is not just a companion—the ginger kitty is a villain in her own right. Her main antagonist is Stretch, the droopy-eared, crime-fighting dog owned by ACME. 9. CARMEN HAS A CONNECTION TO JIMINY CRICKET AND SLEEPING BEAUTY. Raymond Portwood, Jr. was the principal inventor of the Carmen Sandiego concept and original computer game when he worked for California-based Broderbund Software. Before joining Broderbund, he was an animator for Disney and worked on Sleeping Beauty, Lady and the Tramp, and Peter Pan. He also assisted on drawings of Jiminy Cricket. 10. CARMEN MAY HAVE CROSSED PATHS WITH SOME OF J.D. SALINGER’S CHARACTERS. When Carmen was a kid, she won lots of money on a quiz show called It’s a Wise Child. The winnings enabled her to develop her taste for globetrotting. The name of the show is a reference to the one the Glass children participated in in J.D. Salinger’s Franny and Zooey. 11. ROCKAPELLA KEPT ROCKING AFTER THEIR TV GIG ENDED. Rockapella was the “rock acapella” group that served as the in-house jam band on Carmen Sandiego. Originally formed by four friends from Brown University, the lineup changed over the years. The current incarnation doesn’t feature any of the original four members, but the original Rockapellans still make music—one, Sean Altman, now performs Jewish-themed songs under the name Jewmongous. 12. A CARMEN SANDIEGO MOVIE MAY HAPPEN. In 2011, Walden Media bought the movie rights to Carmen Sandiego, with Jennifer Lopez attached to the project as a producer. Back in the ’90s, Disney bought the rights and planned to make a live-action film starring Sandra Bullock, but the project fell apart. Walden says their vision for the Carmen Sandiego movie is “National Treasure meets The Thomas Crown Affair.” Lopez reportedly isn’t planning to star in the movie, so casting is still wide open. 13. IN 2016, CARMEN SANDIEGO'S IDENTITY WAS REVEALED. Although the question of "Where in the world is Carmen Sandiego?" has been answered plenty of times (in video game and TV show form), the question of who is Carmen Sandiego had always been more difficult to respond to—until last year. 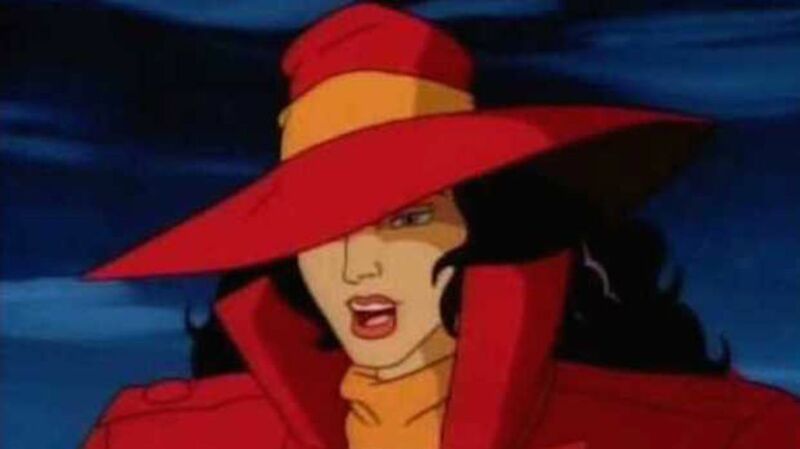 While some famous actresses’ names (Sandra Bullock and Jennifer Lopez, for example) have been bandied about to play Carmen in the aforementioned movie adaptation, one person has actually portrayed the character—an unidentified woman who starred as a shadowy, face-hidden version of the supervillain in the history-centric late '90s show Where in Time is Carmen Sandiego? The Huffington Post reporter Todd Van Luling was finally able to track down Janine LaManna, the woman who played Carmen, and nabbed her first-ever interview about the role. 14. A NEW ANIMATED SERIES IS IN THE WORKS. On April 18, 2017, Variety reported that Netflix had nabbed the rights to Carmen Sandiego with the intention of producing a new animated series, with Jane the Virgin star Gina Rodriguez attached to voice the titular character. "The series will be based on the iconic educational computer game franchise that followed Sandiego as she traveled across the world stealing national treasures," wrote Joe Otterson for Variety. "It will offer an intimate look into the character’s past where viewers will not only follow her escapades but also learn who in the world is Carmen Sandiego and why she became a super thief. The series is produced by Houghton Mifflin Harcourt for Netflix and will premiere in 2019."